The launch appeared to be North Korea’s most successful missile test yet. A U.S. scientist examining the height and distance said the missile could potentially be powerful enough to reach Alaska. It will be difficult to confirm many details about what happened. North Korea’s weapons program is perhaps the most closely held state secret in one of the world’s most suspicious nations. 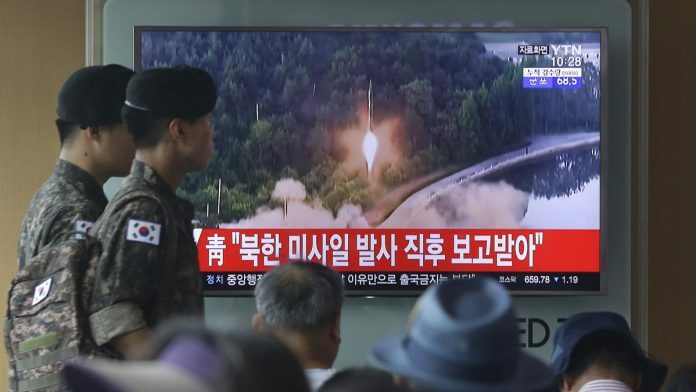 U.S., South Korean and Japanese officials earlier assessed that the North fired an intermediate-range missile into waters near Japan. Japanese Chief Cabinet Secretary Yoshihide Suga declined to comment on whether Japan thinks it was an ICBM, and South Korea’s Defense Ministry said it was analyzing whether the North’s statement was accurate. North Korea has previously launched satellites in what critics said were disguised tests of its long-range missile technology. A test-launch of an ICBM, however, would be a major step in developing nuclear-armed missiles that could reach anywhere in the United States. The launch sends a political warning to Washington and its chief Asian allies, Seoul and Tokyo, while also allowing North Korean scientists a chance to perfect their still-incomplete nuclear missile program. It came on the eve of the U.S. Independence Day holiday, days after the first face-to-face meeting of the leaders of South Korea and the United States, and ahead of a global summit of the world’s richest economies. Most outside and North Korean analyses of the missile’s height, distance and time in the air were roughly similar. U.S., South Korean and Japanese officials say it flew for about 40 minutes and reached an altitude of 2,500 kilometers (1,500 miles), which would be longer and higher than any similar North Korean test previously reported. It also covered a distance of about 930 kilometers (580 miles). North Korea said the missile flew as high as 2,802 kilometers before hitting a designated target in the ocean about 933 kilometers away from the launch site in the North’s northwest. It said the missile flew for about 39 minutes and was made at the highest possible angle. Russia’s military, however, said the missile flew considerably shorter and lower than others reported. Before North Korea’s announcement of an ICBM, South Korean analysts said it was likely that it was a retest of one of two intermediate-range missiles launched earlier this year. One U.S. missile scientist, David Wright, estimated that the highly lofted missile, if the reported time and distance are correct, could have a possible maximum range of 6,700 kilometers (4,160 miles), which could put Alaska in its range, if fired at a normal trajectory. “We hope all relevant parties can exercise restraint, ease tensions on the peninsula as soon as possible, and bring the peninsular issue back to the correct track of peace talks and consultation,” ministry spokesman Geng Shuang said at a regular briefing. In their meeting last week, South Korean President Moon Jae-in and Trump vowed to oppose North Korea’s development of atomic weapons. Japanese Prime Minister Shinzo Abe sharply criticized North Korea for the launch. “The latest launch clearly showed that the threat is growing,” Abe said. Abe, who talked by phone with Trump on Monday, said the two leaders plan to seek cooperation from world leaders when they attend a G-20 summit in Germany. On May 14, North Korea launched a Hwasong-12 missile which its state media said flew as high as 2,111 kilometers (1,310 miles) and landed in a targeted area in the ocean about 787 kilometers (490 miles) from the launch site. On May 21, North Korea tested a Pukguksong-2, which traveled about 500 kilometers (310 miles). The Korean Peninsula has been divided since before the 1950-53 Korean War. Almost 30,000 U.S. troops are stationed in South Korea. Since taking office on May 10, Moon has tried to improve strained ties with North Korea, but the North has continued its missile tests. North Korea says it needs nuclear weapons and powerful missiles to cope with what it calls rising U.S. military threats. Since taking office after his dictator father Kim Jong Il’s death in late 2011, Kim Jong Un has overseen three nuclear weapons tests and a slew of missile tests. Regional disarmament talks on North Korea’s nuclear program have been deadlocked since 2009, when the North pulled out of the negotiations to protest international condemnation over a long-range rocket launch. North Korea Tests Long-Range Missile, Claims Success. North Korea says an intercontinental ballistic missile, capable of hitting the mainland United States.